Today’s Guest Blogger is Beth from Lemon Cadet. Beth is a blogging veteran (going strong since 2006!!) whose blog focuses on what various projects she’s got going on at the time. Oftentimes this includes stories of the latest craft fair she participated in, photos of the seriously cute and quirky items she’s listed in her Etsy Shop, or links to the numerous sources who have featured her work (Parents Magazine, Small Magazine, ohdeedoh, The Storque: Handmade Kids, Ikea Hacker….to name a few!). I’m a bit obsessed with the cute things she’s selling in her shop. 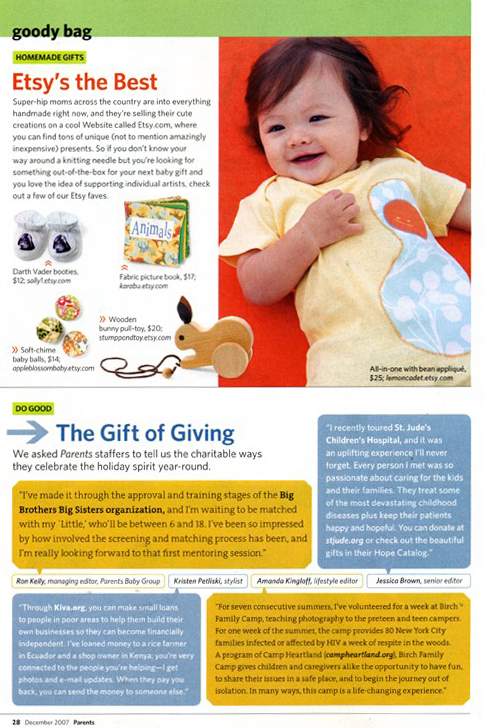 The adorable bean romper in the collage above is available from her shop here, and modelled by her oh-so-cute daughter, Zadie. 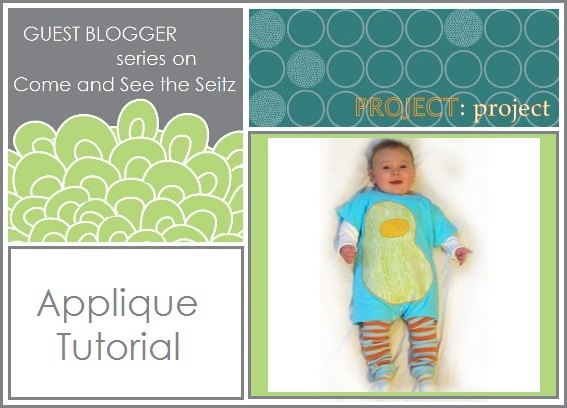 Beth’s clothing features a lot of appliqués (an applique is when a piece of fabric is sewn onto another piece of fabric, to create a design), which makes her the perfect source for an Appliqué Tutorial! Thanks for the great instructions, Beth! –Needles. 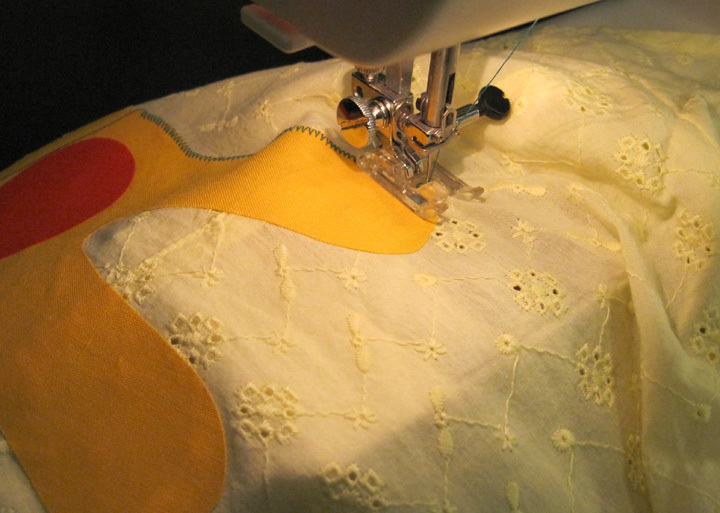 I have found that my machine sometimes likes a knit needle for appliqué onto a knit fabric and sometimes it does not. It’s best to do some tests. Every machine has its own issues and you just never know until you try. 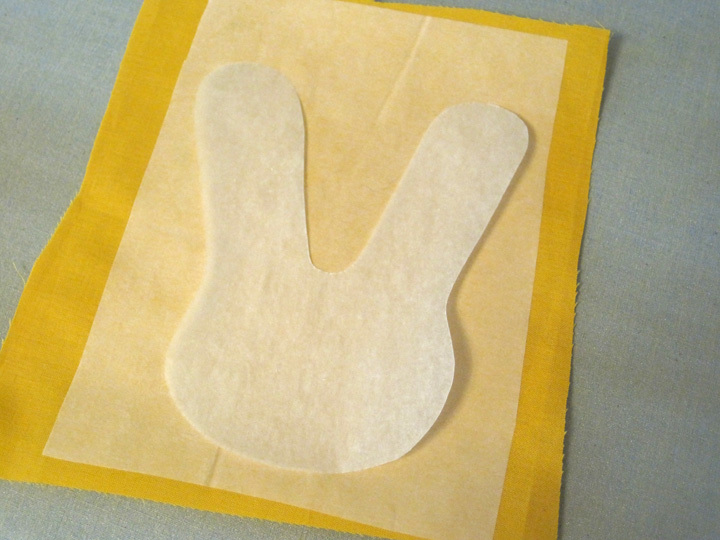 –Tear-away interfacing. This is really helpful if you are stitching onto knits but I never bother with it. Practice makes perfect and saves time and money. –New construction. If you are wanting to appliqué onto a garment that you are constructing, consider carefully the placement of the embellishment. 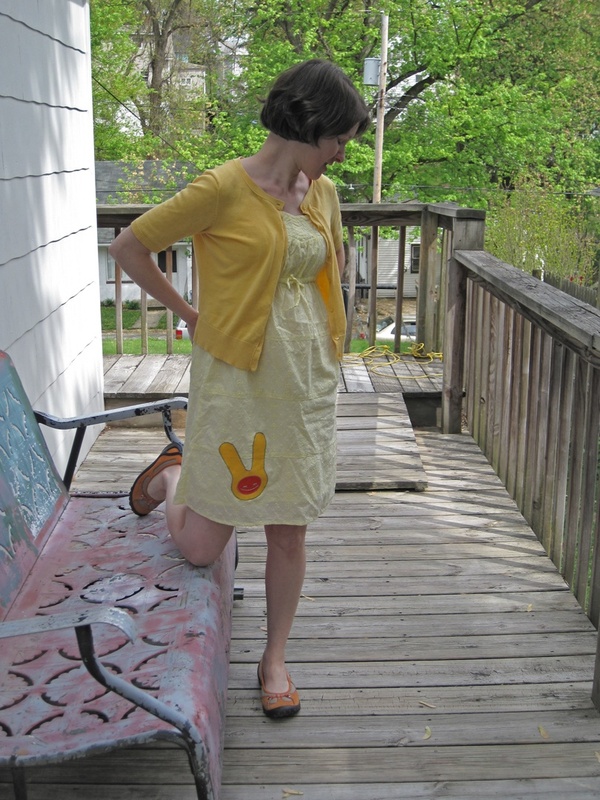 It may be easier to appliqué on a piece rather than the whole thing – especially with pants. You probably won’t be able to get a pant leg where it needs to be in the machine to appliqué after you’ve sewn up your seams. 1. Iron your Wonder Under to the back of your design fabric. It helps to have your pattern ready so you’ll know how much to cut. 2. Pin your pattern pieces to the Wonder Under and cut. You should not use your good scissors as you’re cutting through paper, gluey stuff, and fabric. I have a special pair of scissors just for this. Nothing dulls scissors faster than this combo. 3. Remove pins and set the pattern aside. 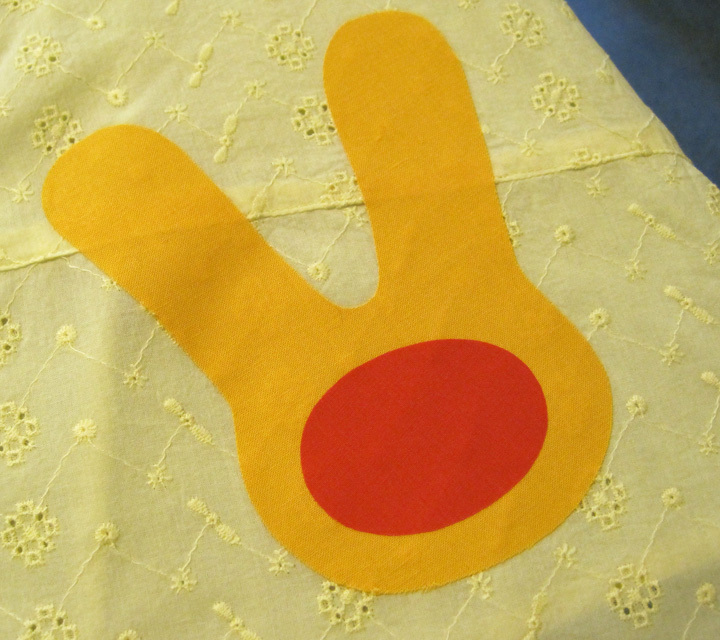 Peel the Wonder Under backing paper off of the design and place it onto your fabric. 1. Do a test of your zig zag stitch. Play around with it a little bit until you get a look you like. 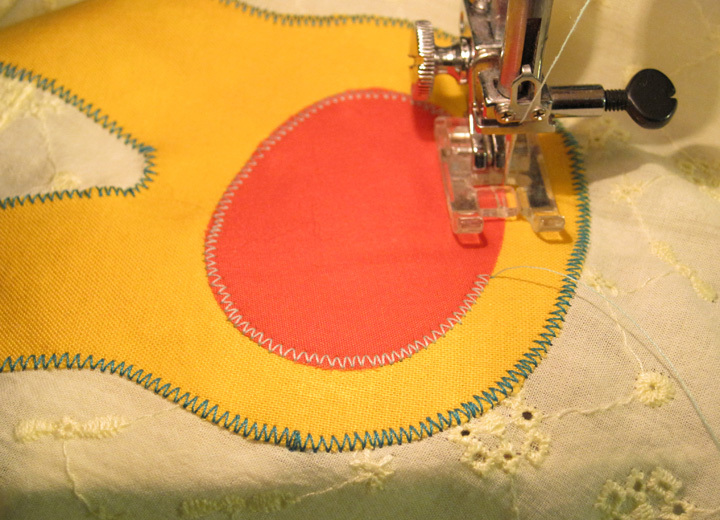 A bigger stitch width and a longer stitch length will allow for more fraying. For the outside of the bunny, I used a 3 stitch width and my stitch length is set on the last (longest) line of the buttonhole stitch. 2. Loosen up your presser foot pressure so it’s easier to turn the corners. 3. First, make a tack knot by doing a couple of straight stitches in place. Then move your stitch selector to the zig zag and go carefully around the outside of your shape. 4. 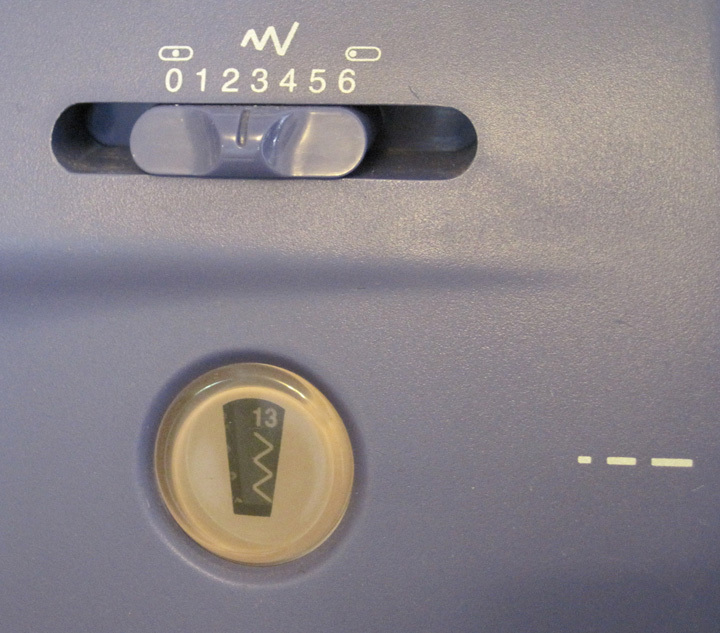 Keep your needle in the down position while sewing. That way if you need to pick up your foot to turn a corner, you won’t get off track with your stitches. 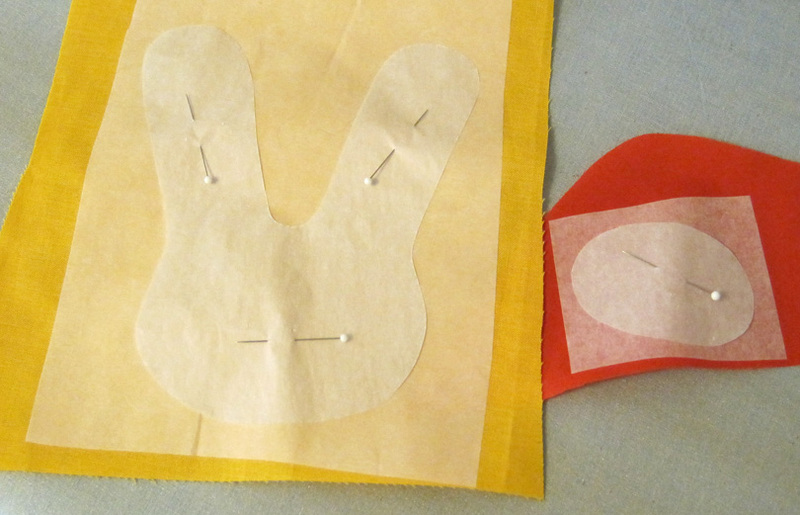 Hint: when sewing around a convex turn (like around the top of the bunny ear), keep your needle on the outside of the fabric. When sewing within a concave turn (like that part of the head between the two ears), keep it on the inside. It will keep a better pivot point and won’t be noticeable at all. 5. If you make a bit of a mess, don’t worry; it won’t be so noticeable after the wash.
6. When you’re finished, make another tack knot. 7. Switch colors and do a second layer if you have one. A dirty little trick is to choose a bobbin color halfway between the two topstitches so that you won’t have to change it. Ha ha. 8. Depending on your design, you might be finished. Or you can keep on going and do some embroidery (you won’t need a hoop as the fabric and the interfacing combine for a nice surface) or some stenciling with freezer paper. The options are endless. Thanks for the great tutorial! I’ve been wanting to try this! This is great! Thanks so much to both of you, I’ll be linking. Great tutorial…I have wanted to try this. Your instructions are very detailed and clear. With your instruction I know I can pull it off! 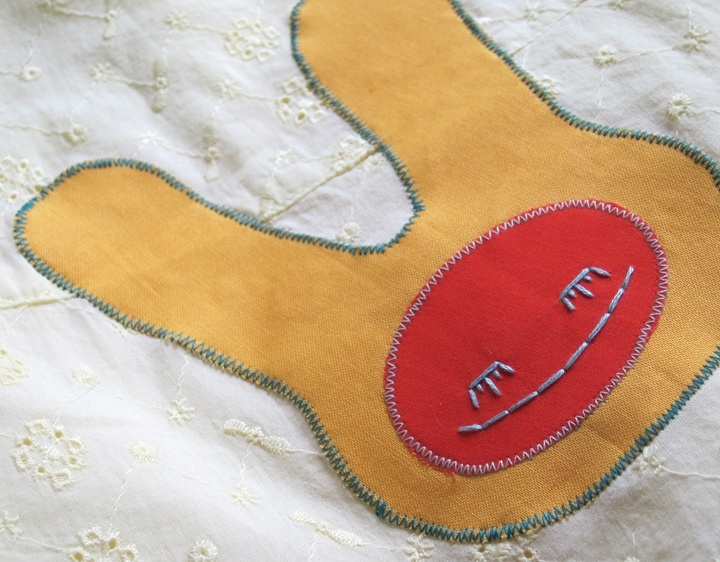 Your bunny is super cute…love the way you embroidered the face. I have a question not related to the tutorial. I love the shoes you are wearing in your picture…where did you get them? Sorry! I just saw these comments. Thanks so much for all the feedback! Kristine, the shoes are Privo by Clarks. Got them a couple of years ago. They have a lovely squishy insole. Very comfy!